Description: TSAL043 - This sculpture is not just a random statue that one fixates in any one of your garden niches as cheap garden statues. It is not even just one of those animal statues that finds home in front of the many public libraries, museums or parks, like the many marble statues in London. No, this can be counted as a king among antique sculptures. With its lustrous black sheen and smooth black marble polish, marble artists really outdid themselves to bring you Black Beauty in all her splendid statuesque glory. 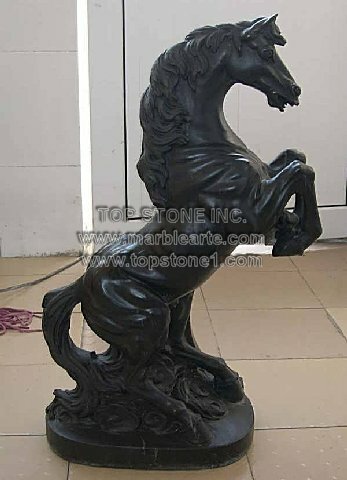 This is one fine marble piece that can become a great fixture for an ancestral home, in a public fountain or even as a honorary recipient for marble horse statues among those very famous marble statues that people deem artistic at museums.